« Who Were the Folgers? First of all, I know he (and later, I’d discover, his parents—they bought TWO copies) got this book out of fear—and the good intention to do well in this unit. How will we understand this play without the “plain English” available to us? How will we learn what’s happening if we can’t see through the poetry and fancy stuff? This is a common fear, and completely understandable! And how easy it is to buy a copy of a book that boils down the language into words “anyone can understand”! Second of all, I knew it would be important to show him why I was taking that book from him. So here was my next lesson. After determining with the class what it means to be lovesick, sharing ways that people might act when they’re in love, and looking at Orsino’s opening lines for clues about how he might be feeling, we settled on the idea that Orsino is totally lovesick. 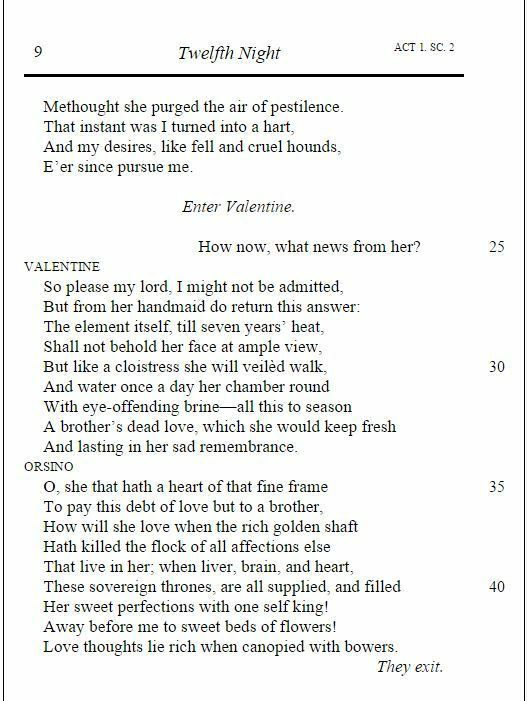 I gave them Act I scene 1 from No Fear that has Orsino learning from Valentine that Olivia is going to be incommunicado for the next seven years. I also copied out a page from a Shakespeare glossary that I have—the page that has the word “bowers” on it. (Kids know to “Look to the Left” when they read the Folger version—the left page is where the glossary is—but not all the words are defined for them.) So we looked again at the last 15 or so lines of the scene. And this is where the lesson gained momentum. We looked up the word “bower” in the photocopied page of the glossary. It means, “leafy glade, arbor; boudoir.” We plugged those two definitions of the term into Orsino’s final speech of the scene. Importantly, students can see that in working through the language Shakespeare gives them, they will be able to see a far more complex character in Orsino than just the guy who was “lovesick” in the beginning of the play. Since this play is about gender and explores the various sexual/social/emotional “permissions” between and within genders, we must really give permission to Orsino to be a guy experiencing attraction—all kinds of it. This will set us up for all of the “raised eyebrow” moments when Cesario enters the mix. Each time I am tempted to reach for a No Fear version or to Google up a meaning of a puzzling line, I have to remind myself that when I use those short cuts, I’m not studying Shakespeare any longer. What makes it Shakespeare is the language. It can be really daunting—but word by word, meaning by double meaning, I can show my students little windows into these characters’ identities which, in the end, make the characters that much more believable, three-dimensional, memorable. Wonderful way for students to discover that the very thing they’re afraid of is what will make Shakespeare fun for them!